An analysis of air bubbles in ice cores from glaciers shows that the last time the earth experienced rapid warming, there was no giant release methane from frozen deposits, a scenario feared by some scientists. In the study led by current and former researchers from Scripps Institution of Oceanography, scientists analyzed the chemical signature of methane that was present in the atmosphere during an abrupt warming event 11,600 years ago. The researchers harvested ice cores from Antarctica’s Taylor Glacier and found no detectable contribution from the naturally occurring fossil deposits of frozen methane that are common in permafrost and ocean sediments. 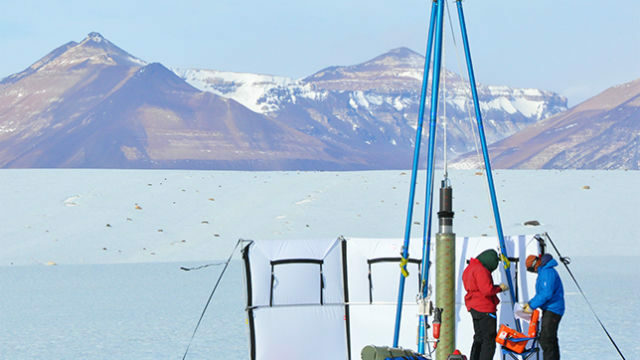 “This finding is important because it shows that the idea of a ‘methane time bomb’ coming from warming sediments and permafrost is one thing we don’t have to worry about in connection with global warming,” said Scripps scientist Jeff Severinghaus, who has been involved with this research project since 2000 and leads the study of ice core records at Scripps. The National Science Foundation led funding of the research, which involved the extraction and transport of dozens of 2,000-pound blocks of ice from Antarctica over the course of a decade. Many scientists have proposed that the burst in global methane levels during the episode nearly 12,000 years ago must have been caused by large emissions of “fossil methane” suddenly released from Arctic lakes, permafrost, or through the melting of methane hydrates — solid forms of methane that exist on the seafloor at cold temperatures and under great pressure. The warming episode saw global temperatures rise by 6 degrees Fahrenheit , and in one region of the North Atlantic Ocean by 20 degrees over several centuries. A concern has arisen in recent years that planetary warming, especially at the poles, could trigger a similar sudden release of fossil methane, which is is a more potent warming agent than carbon dioxide. The team led by Petrenko was able to distinguish the origin of the methane in the bubbles of air trapped in the Antarctic ice. The amount of fossil methane found in the samples was negligible. The researchers believe that soil and marine bacteria that feed on frozen fossil methane as it melts may explain its limited release, by preventing the methane from ever reaching the atmosphere. But the research team said its finding suggests that the amount of methane put into the atmosphere by human activities may be under-counted by 25 percent or more.